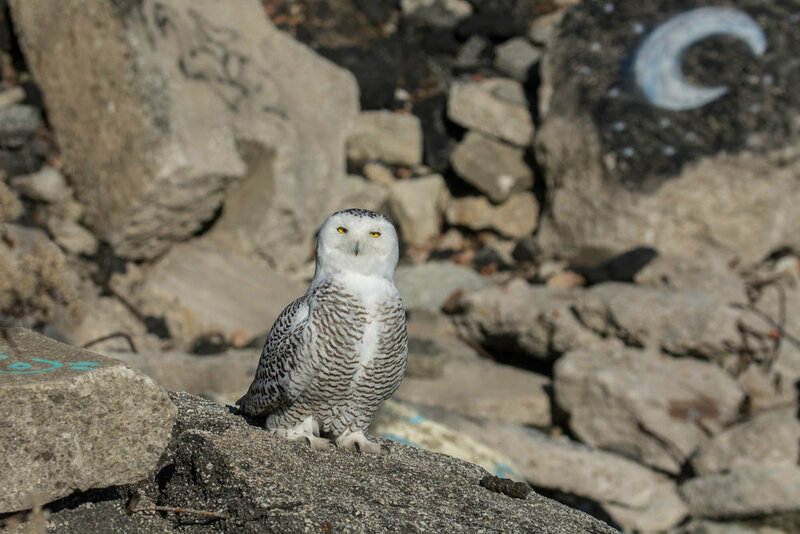 I will remember the winter of 2017-18 in Chicago as the winter of the Snowy Owl. To this novice birder, it's a bird I never expected to see in "the big city," yet that winter I saw one on at least 10 occasions in 6 different locations. As it turns out, I learned, every 7 years or so a large number of Snowys travel unusually far south from their home in the arctic region in what the experts call an irruption. This was one of those winters. There are no trees in the arctic, so the Snowy Owl is comfortable perching on the ground, often right in the middle of fields and open spaces, where they can be surprisingly difficult to spot, for such a large bird. The first one I ever spotted was sitting on a rock on Northerly Island, right out in the open. I had been walking the lakefront looking for waterfowl, my gaze fixed on the water, when I practically walked right up to this majestic bird as it was calmly catching some rays. When I turned and saw it sitting there, I think I was more surprised than she was. The books tell me that the main diet of the Snowy Owl is lemmings and other small rodents. However, those that travel all the way south to the Windy City, where we have no lemmings, show some creative culinary adaptation. Some will prowl our alleys looking for rats—a diet that, unfortunately, can put them in the hospital from ingesting the rat poison that accompanies our city rats. Others cruise the lakefront and pick off sleeping waterfowl. This winter is not proving to be as Snowy-owlish as last winter. I’ve been fortunate to see only one so far, but I’m still looking, and I encourage you to do the same!